Discharge cannot be measured continuously with the sensors used on the StreamPULSE project. At monitoring sites not correlated with a USGS stream gauging station stage-discharge relationships must be developed to predict discharge from recorded water stage. 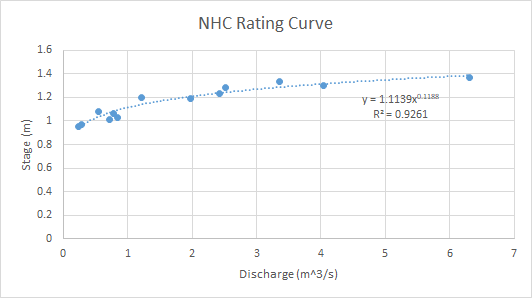 Rating curves are utilized to combine continuously monitored water level data with with measured velocity data to produce a regression for estimating discharge. Pour salt into bucket and mix together while the bucket is in the stream to prevent temperature increase. Amount of salt will vary depending on stream discharge. The goal is to double the baseflow conductivity with the salt addition. 100g NaCl for headwater streams, 500g NaCl for up to third order streams, +1000g NaCl for up to fifth order streams. Allow salt to completely dissolve while mixing in bucket. Once velocity has been measured over a range of discharges a relationship between the water level logger and velocity will start to develop. Here are examples of rating curves for StreamPULSE sites around Durham, NC. Notice the difference between the USGS rating curve and StreamPULSE’s measured rating curve. 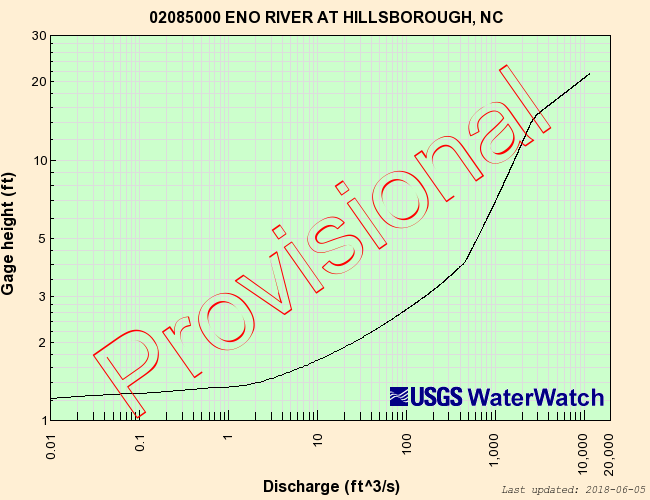 The USGS has advanced ways of calculating discharge at high flows. We are limited in this project by the depth of the water because it isn’t feasible to measure discharge by hand at high flows.